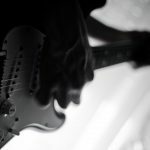 Kicking off this guide is exactly what you came for; our top guitar stand selections, chosen for guitarists by guitarists. We’ve added as many variations and shapes as possible, so whether you’ve got a flying V or a beginners classical guitar we’ve got you covered. And don’t forget, you can use the handy ‘Jump To’ section above to get to where you need to be! *Updated in January 2019 with new categories and information. 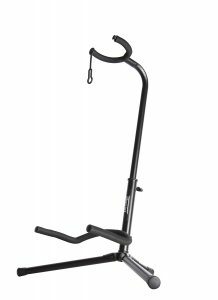 The Gleam Guitar Stand is the first on our list because it’s probably already in the homes of most guitarists, and if it isn’t we suggest it should be! 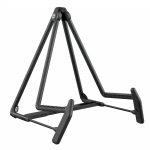 The classic A-Frame stand shape, this is ideal for guitarists looking for an affordable, durable and compact solution to storing their instruments. Not only does this guitar holder look good, but it’s also guaranteed to keep a good grip of your axe. Wall hanging stands are another popular form of guitar stand, both for assured safety and for ease of storage. They can be rapidly taken down and installed, so they’re also great for players who are on the move and need a trusted form of storage and stability to ensure their guitars are safe. Who doesn’t love that black walnut finish too? If you came to this guide looking for a multi-use rack for up to five of your most prized guitars, then look no further than the Gs525B from hugely popular brand Hercules. The rack is made for all styles of acoustic, electric and bass guitars, crafted with an adjustable position for perfect fit for each guitar. 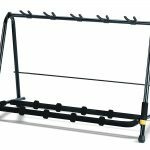 This rack is recommended for portable stage use, and with special built-in foam on the holders this rack comes with safety assured. We recommend this one for gigging guitarists and bands looking to keep their options open on the road. 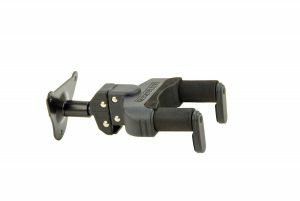 This is also great for owners of multiple acoustic guitars who are struggling to find single holders that get the job done. Here’s one specifically for the acoustic aficionados amongst us. 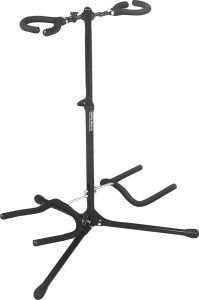 Another hugely popular brand, K&M have branched out to provide a specific steel collapsable stand just for the acoustic guitarists. With a wide base and collapsable construction, the 17580B Heli 2 is as completely tailored to the (often awkward) shapes of an acoustic. Perfect. This stand is great for full-body acoustic and jumbos looking for a safe storage solution. Looking for a guitar hanger you can screw in? The GSP39WB from Hercules is another portable guitar storage device, brilliant for ease of reach guitar playing. The hanger is coated with unique foam around the grips, and is weighted perfectly for safe storage at the neck downwards. If you can’t keep your hands off your guitar, then a hanger is the best option. If you’re looking for a low-cost storage device for live, on-stage playing, then you can’t give this stand a miss. Just pop your guitar in and go. It’s as simple as that! The stand comes foam coated and fully collapsable, so you can get up and go with ease. 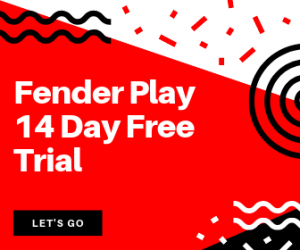 The shape also makes it incredibly easy to just grab your guitar when at home, so if an idea strikes and you’re prone to impromptu guitar playing sessions and song writing, then this one’s for you! If your guitar is particularly heavy (we’re looking at you Michael Angelo Batio) or if you’re in the market to splash out a bit on a decent stand, then you need to take a look at the GS414B A/G. This stand comes with locking mechanisms and foam coatings from top to bottom, with additional rubber rests to ensure your guitar isn’t sliding anywhere. And let’s face it, it looks as cool as a guitar stand can get too. 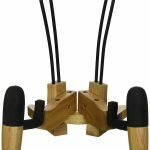 The deep cradle design of the String Swing guitar holder is what has made us include this holder on our list. If you’re worried that your guitar may be too odd of a shape, or may be too large for the standard holder, then the BCC11K is the one for you. The deep cradle also pivots and adjusts to the weight of the guitar, with the ability to support guitars of all shapes and sizes. 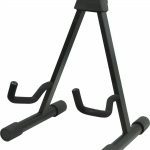 The Musicians Gear guitar back stand is another lower-end addition, cheaper than many in this list but great for beginners and players struggling for space. The padded tube construction grips and holds the guitar perfectly, and it’s another fantastic stand for players who just can’t stop picking their guitar up. As stands go, it’s a great choice. Now we’re getting lucrative. From our favourite brand Hercules comes the GS432B A/G Tri Guitar Stand, a a combination of 3 locking stands, compacted together for the ultimate storage solution. This stand makes the top of our favourites list not only because the storage and transport implications are amazing, but safety and durability is assured with this brand. The locking neck grips, built-in backrests and specialised foam will keep your guitars safe. If you’re just starting your guitar collection and wanted to keep each guitar at hand (and safe), then we can’t recommend the Hercules Tri Stand enough. What’s that you say? Not another string swing to add to this list? Not to worry, we’ll keep this one brief. We really love the String Swing wall hanging range due to their different wood tones, meaning that you can mix and match the colour of the stand with your interior. Plus, the storage implications are great for beginners or occasional guitars who just need to store their one guitar in a safe place. 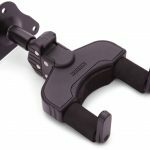 We’d recommend this wall mount for an electric guitar, particularly for beginners who don’t intend on expanding their instrument collection in the near future. This A-Frame is ideal for the safety conscious guitarists, and for players looking for a solid steel construction to back up those safety claims. With rubber coatings on the bottom holders, and coated rubber grips for slide reduction, the A-Frame is ideal for travelling guitarists looking to transport their storage device along with their instruments. If you need an A-Frame stand which is built to last, then the Neewer Universal is for you. 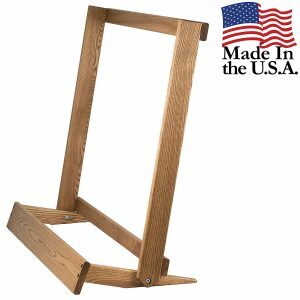 It’s often incredibly common to find guitar wall hangers and smaller holders/stands out of wood, but at Guitaarr we often don’t see complete racks made from the material. Not to say this is a bad thing, and it’s definitely a device to look at if you plan on buying one rack and keeping it in your home. 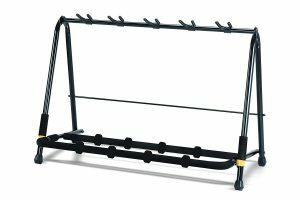 The String Swing rack is crafted from oak, and comes with flat pack travel capabilities and a lifetime structural guarantee. Now there’s quality! The XCG4 is a great all-rounder, ideal for owners of acoustic, electric and bass guitars of all sizes. 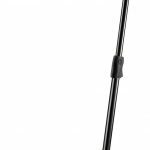 The tripod stand is built with heavy-duty sturdiness in mind, with a solid steel rod middle for locking safety. The neck position also has a swinging lock, and rubber stops at the bottom to ensure the stand stays in place. Another ideal classic stand for the everyday player. Check out this futuristic piece of kit! 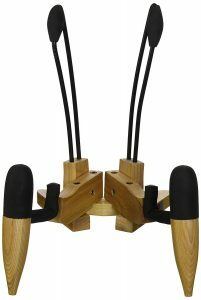 This is an absolutely brilliant floor stand for owners of multiple stringed instruments, with the adjustable arms offering complete flexibility for the shape of your instrument. The strong build is both compact and light, with a lifetime guarantee thrown in as standard. If your guitar is an odd shape, or you require a small stand with a strong build, then don’t miss this beauty. We know what you’re thinking. Not another String Swing addition? Hear us out, this one is different. 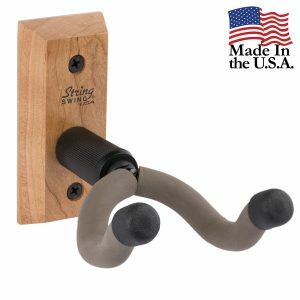 This time we’re adding in a wall hanger from String Swing, specifically their horizontal hanger for narrow body guitars. 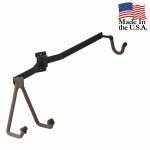 The wall hanger is constructed from durable coated steel, and will last a lifetime installed on the wall of your choosing. 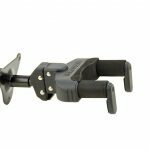 As this wall mount hanger is crafted specifically for narrow body guitars, we recommend this mount for shredders and owners of thin neck, light/thin body guitars such as the Ibanez RG range, or even the classic Fender Stratocaster. 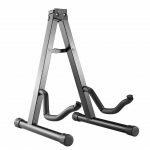 Unlike our metal counterpart above, this stand is crafted from a unique wood base,with a thick black foam and rubber padding added alongside deep metal support rods. It’s also incredibly easy to transport and store. Definitely worth a look if you’re a fan of wooden crafted goods. Got a prized guitar you want to look after? Maybe you’re leaving for a while and want your guitar to be secure, or are just looking for a compact guitar wall hanger with added security? Once again, our top brand Hercules has come to the rescue with their wall hanger with a lock & key addition. Just install your wall hanger, add your guitar, then lock the neck with their handy contraption. It also doesn’t cost the earth, so if you’re after that extra security then this wall hanger is perfect. This is certainly a quirky piece of kit, ideal for acoustic guitarists looking for a storage solution for full-body acoustics with large bodies. The build reduces instrument sloping, angled in a way that stores guitars with precision. It’s an A-Frame guitar stand, but not as we know it. The last stand to finish off our top 20 list is the ultra lightweight offering from K&M. Made from an aluminium blend, this stand is the best solution for travelling guitarists, and is a great alternative to large stands in apartments or homes with cramped space. It’s sturdy, light, discreet, and gets the job done. You’ve looked through our top selections, but which specific kind of stand is right for you? 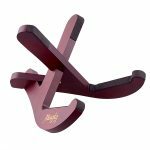 Whether you’re looking for a compact storage device, or need a way to house your extensive guitar collection, you’ll find the exact type of stand which is perfect for you. When you think of a guitar stand, these are probably the kind that comes to mind. Also named tripod, tubular or tri-stands, this is the classic 3-legged shape when it comes to guitar storage. 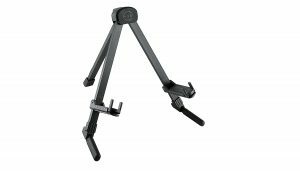 Tripod stands are incredibly popular because they’re easy to set up, can be taken down and transported, and offer stability on a range of surfaces. A-frames are another popular solution, named because they resemble the letter ‘A’. The groove on the two bottom legs supports the guitar, with the body resting at a slight angle against the back support of the stand. A-frames are favoured by guitarists with minimum space, and for those who want a stand with the easiest ability to pick up their guitar quickly when inspiration strikes. Popularised by touring bands and gigging guitarists, guitar racks are the perfect solution to transporting and storing several guitars at once. 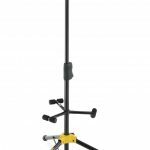 Like most stands, many racks are collapsable and easily transportable, with essential safety features such as rubber guards, metal piping and foam between each segment to prevent friction or potential clashing of instruments. You may be wondering why we’ve included this section, but it’s necessary to understand the many variations of stands which are out there. 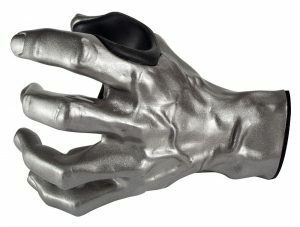 From hand grips to funny stands, quirky variations are not to be missed. They make a great present to the guitarist in your life, or can make a brilliant treat for yourself too. Wall hangers are another incredibly popular choice, used primarily for saving space in small apartments and homes. The hanger is mounted to the wall via various devices, mostly screwing the wood or metal slab into the wall to support the weight of the guitar. Wall hangers take up little room, and as we have highlighted in our top 20 list, they simply look good too. 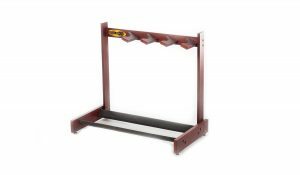 Premium and higher-end stands usually come in the form of hand-crafted, wooden stands or racks. Also seen as high-quality hangers, these often come with a premium price tag too. The example pictured above is a luxury hand crafted rack, offering a total of 4 storage placements with a high-end honey finish. Put simply, when it comes to guitar stands and racks, if it looks expensive it most likely is! 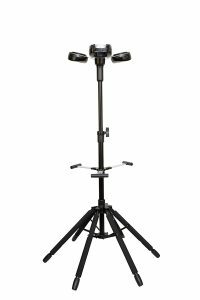 More commonly seen as a duo stand, the stand with multiple additions category is more of a side category of the primary Tripod Stand family. They’re great for players with 2 or 3 guitars who want a storage solution which isn’t as hefty or as weighty as racks can commonly be. 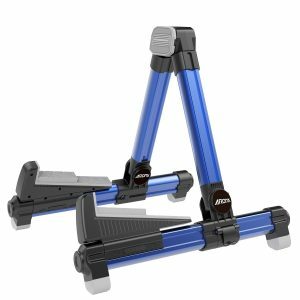 Just like the tripod stands, duo and multiple additions come with reinforced steel, foam coverings and rubber guards for extreme protection and stability. The stand above is truly the final boss of a locking and multiple tripod stand storage solution. Locking stands come with handy locking mechanisms, either with keys or gravity activated locking heads like the one above. If you’re serious about safety, storage, and combining all of the above, then locking tripod stands are the ones for you! 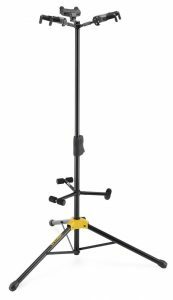 Do touring guitarists and bands use guitar stands or racks? Commonly, guitar racks are the most used methods of storage for touring artists, combined with huge guitar flight cases. Guitar racks make changing guitars for gigging musicians as easy as possible, particularly for guitarists looking to use different tunings within one set, without having to change the tune of a singular guitar each time. For example, these cases are considered the industry standard for touring guitarists. 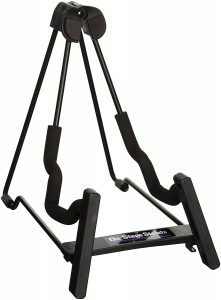 Do guitarists have signature stands? Not really, more commonly a stand or storage device (such as a signature case) will be thrown in as a freebie with a limited run guitar. For example, the 30th Anniversary Ibanez Jem777 comes with a signature Steve Vai case, strap, and certificate of authenticity. 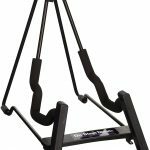 What is the average price of a guitar stand? It’s safe to say that you can get a great stand for $20. 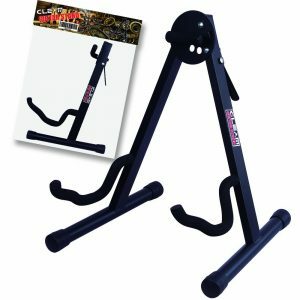 If you’re a UK reader, you’re probably looking at £15 for a good beginners stand. For added safety features, sizes and capabilities, be prepared to pay a little bit more. What material should I choose for a guitar stand or rack? This all comes down to you and your needs. If you’re looking for a stand or A-Frame, you’re probably looking at Steel or light Aluminium for the upper prices. When it comes to racks you’re also looking at a strong metal composite, or wood for the higher priced ranges. 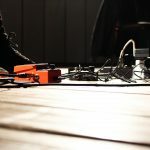 Are guitar stands safe for me to leave my guitar in? All stands are safe, however for complete safety we would recommend either a locking holder, or a high-quality locking stand. Check out the Hercules locking range for safe storage ideas. What is the most well know brand of stand? The most well known brand would have to either be Hercules or String Swing. Is there a stand which can hold all shapes of guitars? 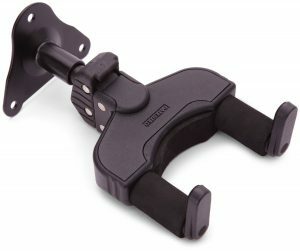 This is most commonly the wall hanger type of stand, which can support anything from an acoustic, electric, bass, or even a ukulele or mandolin. 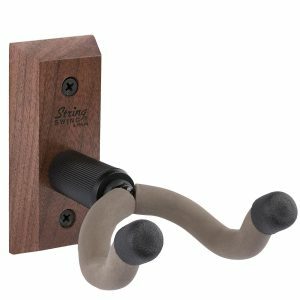 We recommend checking out the Guitar Hanger Wall Hook. What is the best type of stand for any guitar? 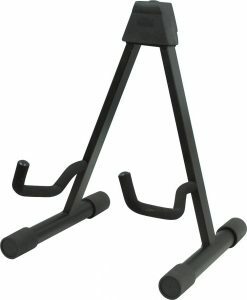 The best type of stand (not specific product) is the locking tripod stand. 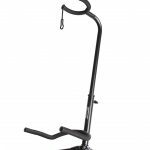 This kind of stand is the ultimate in security when it comes to holding the instrument, as the base, body, and neck are accounted for with coated steel, rubber grips, and a locking neck brace. Take a look at the Tiger Universal Locking Stand as a quality example. 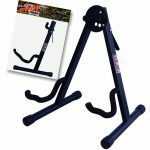 Overall what is the best guitar stand for electric guitars? We can’t recommend our top pick, the Hercules Tri Guitar Stand! It’s affordable, sturdy, and portable. Just the perfect stand for electric guitars. What is the best stand for bass guitars? 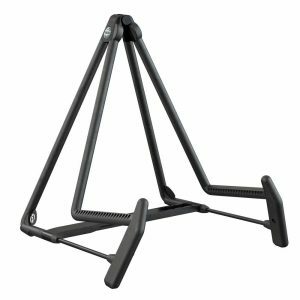 We recommend the Gleam Guitar Stand, as the A-Frame is capable of supporting bass guitars of all sizes. I’m an acoustic guitar player. 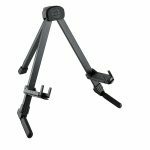 What is the best stand or holder for me? The best option with an acoustic guitar stand is a sturdy, standalone stand. We can’t recommend the On Stag XCG4 highly enough. As long as they are installed correctly, guitar wall mounts are incredibly safe. 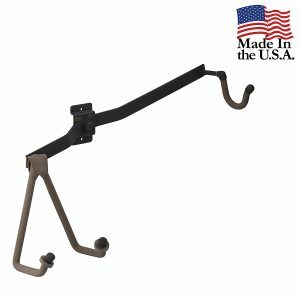 Is a wall hanger bad for the neck or body of a guitar? No. 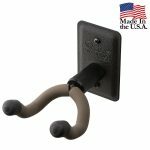 Wall hangers are coated primarily with foam (sometimes rubber guards too), and are built with neck safety in mind (as this is a common question and a valid concern). Be sure to place the guitar softly in the hanger and you will have nothing to worry about. Fan of our guides? Check out the overdrive & distortion pedal guide, and our selection of the best seven string guitars on the market today.